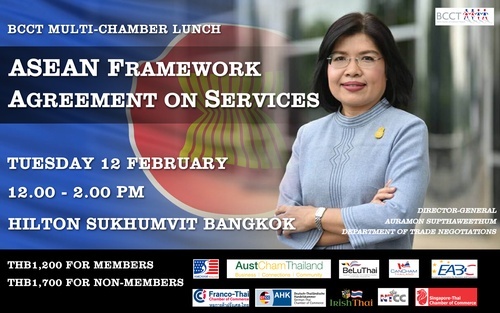 The British Chamber of Commerce Thailand (BCCT), together with AMCHAM, NTCC, AustCham, BeLuThai, CanCham, EABC, FTCC, ITCC, GTCC and STCC, cordially invites you to BCCT Multi-Chamber Lunch on ASEAN Framework Agreement on Services (AFAS) on Tuesday 12th February. Nearest BTS Phrom Phong exit 4. Cost: THB 1,200 for members and THB 1,700 for non-members. This price includes 3-course western set lunch. Payment: Pre-payment is required to BCCT by 5 pm on Thursday 7th February.